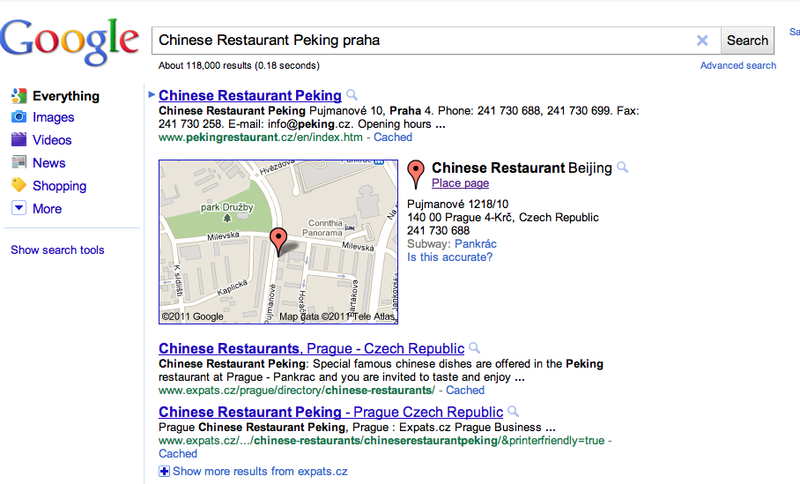 In the process of double checking the phone number for the Restaurant Peking, a Chinese restaurant in Prague, I got a strange search result from Google (see screenshot). Google has a listing for the restaurant, but they've renamed it the Restaurant Beijing. What's next? A listing on Google Music for the Smashing Pumpkins' Conjoined Twins Dream? Our smallest city yet for serious data collection: Tábor, Czech Republic. With only 35,000 inhabitants, shouldn't take long to cover. Brewsta of Czech Please posted photos of a new Georgian place in Prague called Chačapuri, which means "cheese bread" in English. 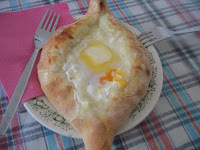 I'd never heard of this dish, usually transliterated as Khachapuri, but it looks delicious. Actually had to add a new category to the database to accommodate this place. We've got over 4,000 categories already, but never had a need for "Georgian Restaurant" until now. We've started serious data collection in our first city of less than 100,000 inhabitants — Ústí nad Labem. In a way, this is an experiment. We expect less competition from other local search sites in a smaller city, but the value of a listing might also be smaller. In the Czech Republic specifically, there is also the possibility that lower incomes in smaller cities will affect internet use. We'll see. A few months ago, I wrote about the possibility of Apple dropping Google and building their own maps and mapping application for iOS. According to recent reports, it appears these new maps will not be ready in time for iOS5. However, I do expect Apple to ditch Google maps at some point, possibly even in a point release of iOS5. Nelso již disponuje nejrozsáhlejším adresářem restaurací, barů a kaváren v Praze, ale nebudeme spokojeni, dokud podniky nebudou všechny. Za tímto účelem nabízíme odměnu 200 Kč každému, kdo nám pošle fotografii baru, restaurace nebo kavárny, která ještě není uvedená na stránkách www.nelso.cz. Ano, je to až tak snadné - jednoduše najděte místo, které neexistuje na naší stránce, pošlete nám jeho fotografii a my Vám převedeme 200 Kč přes PayPal. Hledáme pouze místa, která nejsou v našem adresáři. Pro jistotu zkotrolujte, zda podnik v databázi ještě není na www.nelso.cz. Své fotky pošlete na fotky@nelso.cz. Před odesláním doplňte do předmětu emailu jméno podniku. Do těla zprávy zapište adresu a orientační číslo, pokud je k dispozici, a informaci o druhu podniku, např. řecká, kotejl bar, atd. Všechny fotky musí obsahovat souřadnice GPS jako meta data. Ujistěte se, že jste umožnili geotagy fotografií ve vašem mobilním telefonu. Pošlete co nejvyšší možné rozlišení, neposílejte zmenšené obrázky. Musí se jednat o fotografii baru, restaurace nebo kavárny, takže McDonald’s je OK ale supermarket Billa ne. V této fázi chceme pouze fotky míst v Praze. Soutěž pro uživatele z jiných měst otevřeme později. “Praha” je definována na této mapě. Fotografie musí být zaostřená a jméno podniku musí být viditelné. Můžete poslat několik obrázků stejného místa, pokud to bude potřeba. Obrázky posílejte z emailu, který je spojen s Vaším PayPal účtem. Pokud Vaše fotografie a email budou splňovat výše uvedené požadavky, pošleme Vám 200 Kč za každou fotku poslanou na fotky@nelso.cz. Není stanoven limit na počet fotek od jednotlivých uživatelů, ale tato promo akce je omezená celkovým rozpočtem 250 000 Kč. Aktuálně vyplacenou sumu budeme průběžně publikovat na Facebooku. Well, not anarchy exactly, more of a small hiccup (but then "Small Hiccup in the U.K." wouldn't have made a very good post title). Earlier today, we started our first real efforts at collecting data for Nelso in the UK, starting with Cambridge, England. Using the Nelso iPhone data collection app, the operator in Cambridge noticed right away the incomplete addresses being returned by the Google Maps geocoder. Specifically postcodes, which were being returned in the strange format "CB4 1" instead of the expected six alphanumerics of a full UK postcode1 (e.g. 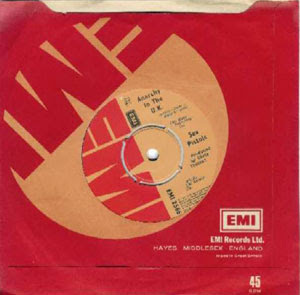 "CB4 1AJ"). We'd never had this problem in other countries, and for a few minutes I was stumped. However, a quick look through the Google documentation for the geocoder reveals that in the UK (and similarly in Japan and China) the postcode database is copyrighted by the Royal Mail2, and one needs a license to do postcode lookups based on latitude/longitude. Seems we'll have to pay for a license at some point (although not right away - who sends letters anymore?). 1 Although the only "real" address with three letters at the beginning (rather than 2 letters and a number) is Girobank's "GIR 0AA", Santa Claus does have the UK postcode "SAN TA1", which starts with three letters. 2 Why does the Royal Mail use royalmail.com rather than royalmail.co.uk? Apple building a new mapping application? Many sites are writing today about a new job posting on Apple.com. The Maps team is looking for an exceptional developer to join us in our mission to radically improve how people interact with maps and location-based services. This is obviously interesting news for a local search site that also produces iOS apps. That said, I have no idea what this means. Apple bought a company called Placebase in 2009, and at the time many expected that Apple would use their technology to replace or supplement Google Maps in iOS. That hasn't happened, but it might just be that Apple needs time to integrate Placebase's technology. Placebase does have an API called Pushpin that would allow for much more sophisticated manipulation of geospatial data in iOS. My biggest feature request would be an easy way to use offline maps both in the Maps app and in iOS apps produced by Nelso. Although there are apps in the App Store that support offline maps, it'd be a boon for travelers to have this built right into the OS. The requirement that a user has an internet connection makes Google Maps almost worthless for travelers in Europe, as the cost of data roaming is too high to justify using maps on an iPhone or iPad outside one's home country. Here's hoping they say something at WWDC this year. Once I got my hands on an iPad 2 (the white 64GB 3G model, to be exact) the first thing I did was to take a few photos with the rear ("HD") camera. 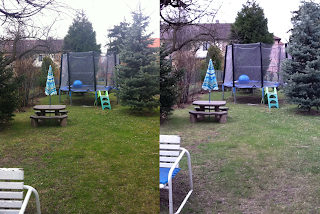 I've written a lot about the iPad 2 camera in the last few weeks, and although I feared the worst, I still held out hope that the camera would at least be serviceable. But after playing around a bit with the iPad 2 camera, all I can say is this: Apple did the absolute minimum they could and still claim the iPad 2 has an "HD" camera. 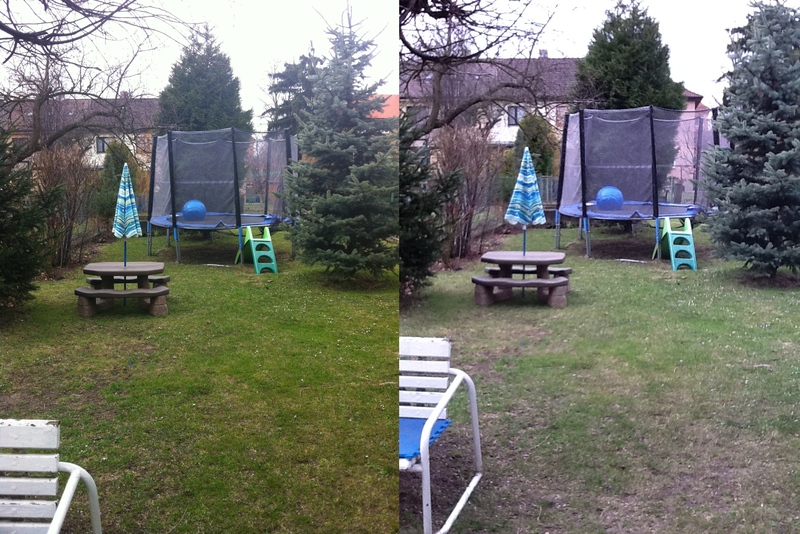 Below are two shots, taken in the same place (approximately), one with the iPad 2 and one with the iPhone 4. You get exactly one guess as to which one is the iPhone 4. Why don't the Nelso sites appear in the Blekko index? Techmeme linked to an article about upstart search engine Blekko today, which prompted me to take another look at the Blekko.com site. Like any good entrepreneur, I immediately did a vanity search to see how the Nelso sites ranked for common search terms like "Prague bars" or "Copenhagen hotels". 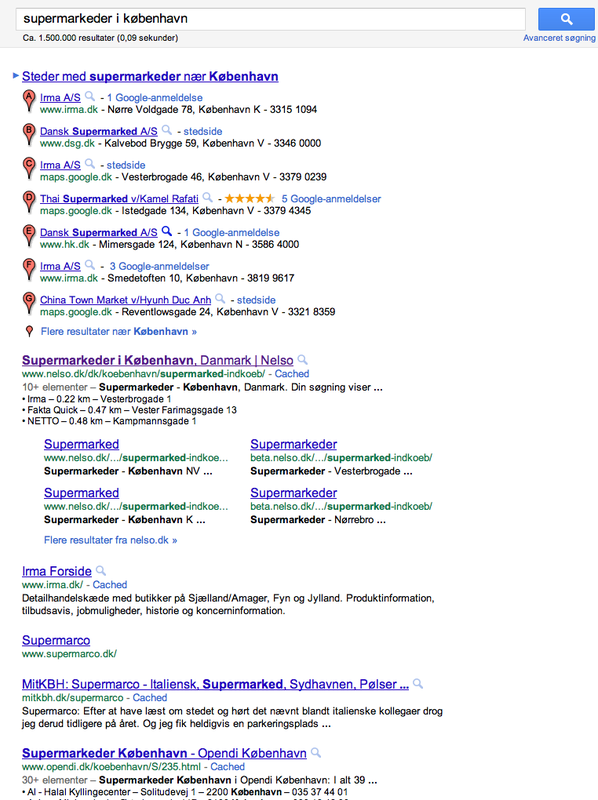 I didn't expect to see Nelso.com at the top of the first page, but I was surprised to find that Blekko doesn't index any content from any of the Nelso sites. 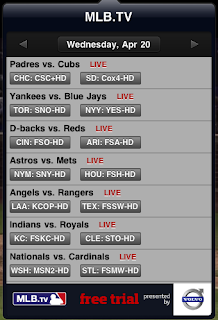 We have a full Web crawl. Come to Blekko, type /date and you can see the sites going in in real time. Our whole crawl is about 3 billion pages. 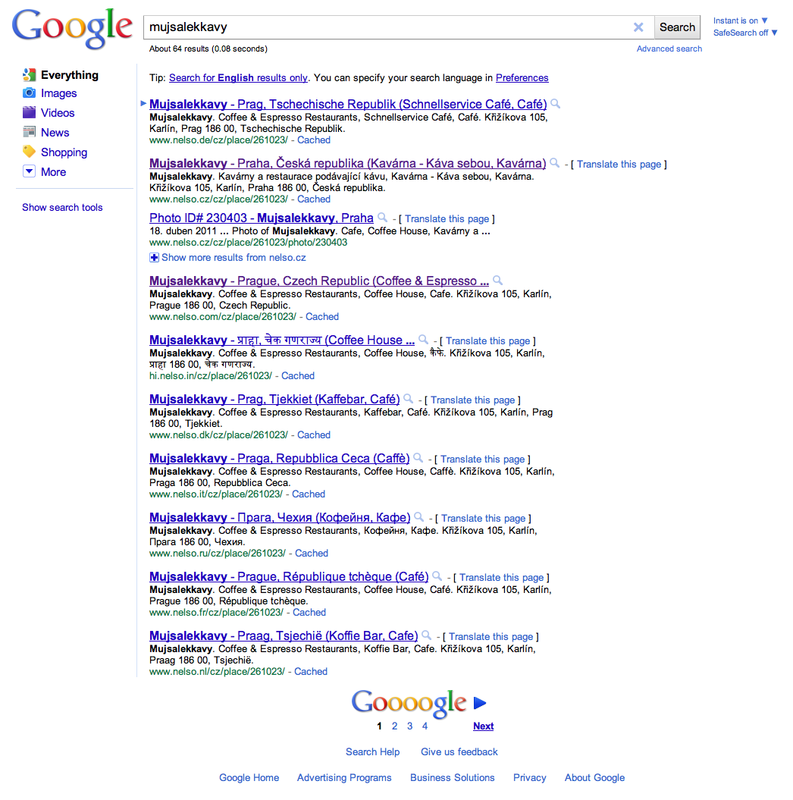 It's not as big as Google or Bing's index, but we biased it to what we think are the best pages. Although we've had the Norwegian translation ready for over a year, it's taken us at least that long to acquire the Nelso.no domain name. Now that we've launched in Norway, we just need a site for Iceland and, depending on how you define Scandinavia, Finland to complete our coverage of the region. When a speaker wants to explicitly include Finland alongside Scandinavia-proper, the geographic terms Fenno-Scandinavia or Fennoscandia are sometimes used in English. I admit to never having heard those terms before. Early stats for the site show most of the traffic so far is to the Denmark and Czech Republic listings. CNET has posted a gallery of photos taken with the iPad 2 rear-facing camera in downtown San Francisco. 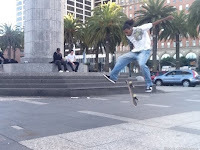 Not very impressive, but I was surprised that the image sensor was fast enough to get this shot of a skateboarder in mid-air. 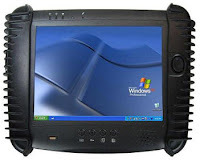 PCWorld ran more comprehensive tests, and also tested the iPad 2 alongside the Motorola XOOM and the Samsung Galaxy Tab. You don't need a trained eye to tell that these two Android tablets beat the pants off the 0.7 megapixel rear camera in the iPad 2. There's no getting around the fact the the back camera in the iPad 2 is sub-standard for 2011. Even the mediocre 2 megapixel shooter from the original iPhone, which is now four years old, would have been better than what Apple put in the iPad 2. What I haven't seen yet, and what is more important for Nelso's data collection efforts, is a shot taken with the back camera outside in bright sunlight. I'll test that as soon as I get my hands on an iPad 2 later this month. We've got two people at the moment collecting data for Nelso in Rome, Italy. You can follow their progress by checking the home page for Rome on Nelso.it. TechCrunch writes today that DailyBooth raised additional financing, and that they are "excited" about the front-facing camera in the iPad 2. Devices like the iPhone 4, with a front facing camera, are particularly DailyBooth-friendly. The new iPad, also with a front facing camera, is just an enthralling to the company. 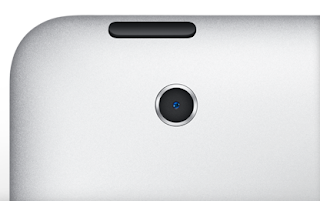 Gruber confirms that iPad 2 rear camera is 960x720? John Gruber of Daring Fireball linked to a photo he took with the iPad 2 while at the event. If we take at the look at the original size of the photo he took, it's 960x720, just as one would expect. While it's possible that Gruber resized the photo before uploading it, that seems unlikely given that he had only a few minutes with the device and I can't see him wasting time with that. iPad 2 Camera A World's First? Although the details of the iPad 2's rear camera are still vague, Apple might have created the first digital camera in history that has a higher-resolution LCD display than the camera's sensor! We can infer from this that the rear camera sensor is capable of at least 1280x720 pixel resolution. However, it's reasonable to assume that still photos will be cropped to 960x720 (like the current generation iPod Touch) to make them the ratio common for digital photos (4:3). 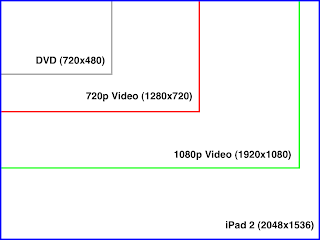 If that's true, then the iPad will have a higher resolution LCD display (1024x768) than the photos it takes (960x720). This is almost certainly a first. Camera sensors have always had a much higher pixel density than LCD displays. The iPhone 4's display might be impressive at more than 300 pixels per inch, but even the first consumer digital camera sensors had much higher pixel density than 300dpi. Thus, an early DSLR like the Nikon D1 had a 2.7 megapixel (2,000×1,312) sensor but a puny 120,000 dot (400x300) rear LCD. The very first digital camera marketed to consumers in the US, the Apple QuickTake 100, didn't even have an LCD display because small LCDs at the time were prohibitively expensive. Are the photos taken with the iPad 2 going to display with black bars at the top, bottom, and sides? Normally one needs to dramatically downscale digital photos to display them on the LCD of the device that took the photo (I can't even display full-resolution photos from my iPhone 4 using my 27" Apple Cinema Display). Apple are certainly pioneers in digital photography, but in this case that's not a positive thing. We're undertaking a comprehensive review of the translations on Nelso.ru, and adding thousands of new translations for categories that have been added recently. You can see some of the improvements by browsing our Prague listings in Russian (most of our Russian-language traffic is for Prague). Take a look at the top 15 search terms on Google sending traffic to Nelso.cz for the month of February, 2011. Notice a pattern? 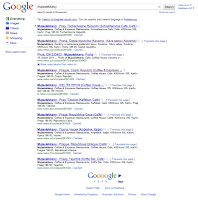 There are quite a number of luxury goods related searches in this list. I don't have a good explanation for this, other than the fact that many of these brands have Flash-heavy sites that probably aren't indexed well by search engines. Demand Media (DMD), famously called "The Answer Factory" in a Wired article, rose 37 percent on its first trading day, closing with a market cap of $1.87 billion. Seems investors are still not too worried that Google will classify Demand Media's content as spam and remove it from the first page of search results. Update: Businessweek has a long piece on DMD today. Much like place databases are used by so many location-based technologies today. If you want to build an app that talks about different places around the world, you don't have to create a brand new map of places from scratch. That problem has been solved. Update: This post was mentioned on Crunchgear and AppleInsider, and it seems many of the commenters didn't understand the point of the original post. At this point I wish I'd never mentioned video in the post (or had relegated it to less than a paragraph). My point was not that you won't be able to watch DVD resolution content on some future 7,680 x 4,320 pixel HD TV (1080p x 16) - the point was that additional resolution is only worth paying for if you're going to use it (and to answer the question of many commenters - yes, I have heard of upscaling video). Of course user interface elements and text will look amazing on the super high-res iPad 2 (or iPad 3). 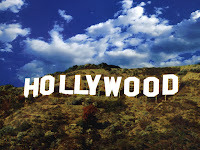 But almost no content (forget about video for a second) is currently created with a 3 megapixel, 260 dpi display in mind. This is especially true of most graphics and photos used on the web. So, the home page of the New York Times will have print-quality text (in Safari for iPad 2) while all the rest of the graphics will be of much lower resolution and have to be upscaled (the main home page image is only 330 pixels wide). The effect will be a bit jarring. On the current iPhone 4 I can tell at a glance that an app hasn't been updated for the new retina display - the app icon even looks out of place on the home screen surrounded by high-res icons from other apps. And yes, yes, I know that it's possible to use the web on a 30" monitor that has a resolution greater than this hypothetical iPad 2. But this works because a 27" iMac (for example) uses the additional pixels to create a physically larger display, not to increase the pixel density. Graphics that were designed on a 20" monitor and assumed a ~ 100 dpi display look fine on a 27" monitor - they are the same physical size on screen and are not pixel-doubled. And what about iOS apps? I write offline travel apps for the iPhone, and because they don't require an internet connection, I include all the images in the app. The next update of my Prague guide will contain more than 10,000 images (at 300x200). Can I use these in a universal app that runs on an iPad 2? Sure, but the result won't be very satisfactory - blurry, massively upscaled images on the same screen as razor-sharp text and UI elements just won't look good. 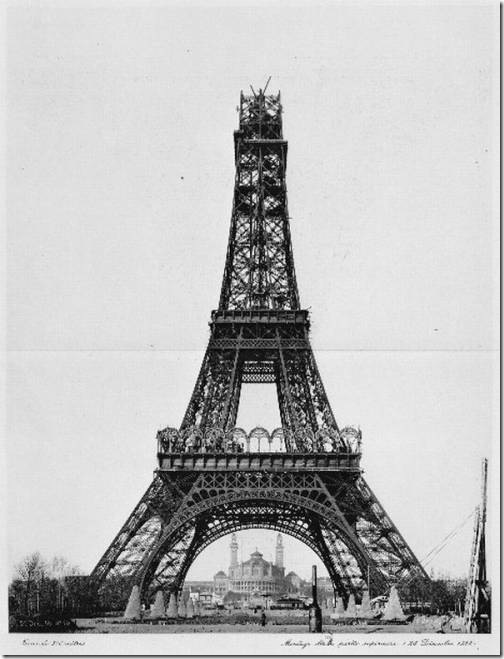 I'll be forced to include much higher resolution images in the app, and that will mean leaving most of the images out of the app entirely (I can't expect users to download a 5GB travel guide). So, again, yes - I do understand the concept of upscaling. The point wasn't that you can't use the current web or a 2011 iOS app on the 2020 gigapixel 100" wall-mounted iPad 11. The point was that users are going to expect all the elements on screen to be of the same resolution, and that means the creation of a massive amount of new content (thus the "Lack of Content" part of my post title). And did I mention that I understand the concept of upscaling video? Because I do. The iPad 2 will be announced soon, and thus there are a lot of rumors floating around as to the second-generation iPad's technical specs. Some of the new features are almost inevitable (front and rear cameras, more RAM) and some are less likely (SD card slot, new processor). But the real wildcard is the iPad 2's display. Both the iPod Touch and iPhone got 960x640 "retina" (i.e. more than 300dpi) displays in their latest versions, and there is a growing consensus on gadget blogs that the iPad 2 will have a similar "ultra high-res" display. Even John Gruber of Daring Fireball isn't dismissing the possibility of a 2048x1536 display on the iPad 2. We're talking about an iPad with nearly the resolution of a 30" desktop display. Let's assume for the sake of argument that all of the usual problems with such a display have been solved (battery life, cost, speed, etc.). Even if the iPad 2 comes out in a 16GB WiFi version for $499 with a 2048x1536 display (four times the pixels of the original iPad, which is 1024x768), where is the content going to come from? 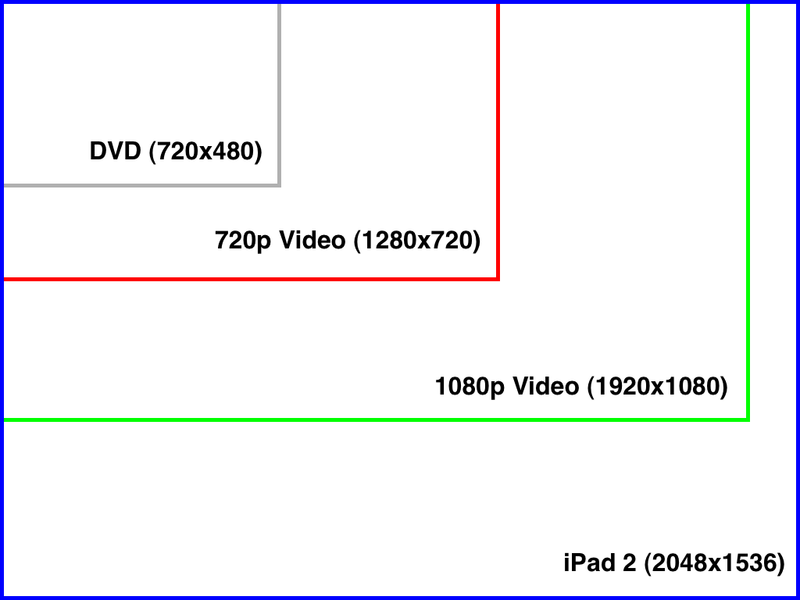 Take a look at the graphic I created showing the relative sizes of popular video formats in relation to this theoretical iPad 2 "retina" display. Forget about DVD (Standard Definition) video, which if displayed at native resolution would be little bigger than a postage stamp on this new display. 720p HD video (the highest resolution sold on iTunes) would fill only a quarter of the screen, and 1080p video would have black bars not only along the top and bottom, but also along the sides of the screen. Of course, Apple will scale up these videos to fill the screen, but most people don't expect pixel-doubling when watching HD video. And what about on-line photos? Are web site owners now expected to post two or three megapixel photos on their sites to support Safari on iPad? Will the Photos application for iPad import full resolution photos when syncing to your computer? How big will games be if they fully support the 3,145,728 pixels of such a display? I'm not arguing that Apple won't include such a display on the iPad 2, but if they do, I hope there's a 128GB version so that I can load more than one movie on it at a time (assuming a few apps, some photos, some music, and 1080p video, the 16GB version would hold about one 90 minute film). I guess my next purchase is a RED camera to shoot home videos that will support the iPad 2's display.